The construction of a giant observation tower in the middle of the Amazon rainforest – a project of German and Brazilian scientists – is nearing completion. Photos from the top of the structure, which is higher than the Eiffel Tower, reveal the process. The Amazon Tall Tower Observatory (ATTO), situated in the Brazilian municipality of Sao Sebastiao do Uatuma, will monitor weather and record long-term measurements of greenhouse gases from July 2015. Situated in the middle of the Earth’s largest rainforest, it will study how the ecosystem interacts with the atmosphere, to determine whether it absorbs or emits net carbon (CO2 and methane gases). 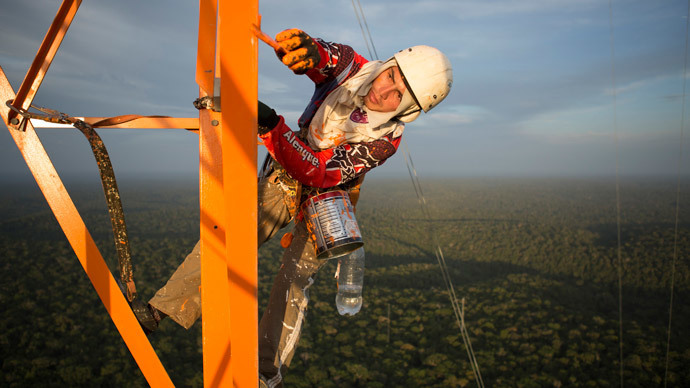 The creation of the climate observation structure in the middle of the Amazon began on August 15, when German and Brazilian scientists joined forces to build the 325-meter tower. “It is the first long-term tropical observatory that is able to analyze the health of [a] tropical ecosystem as important as the Amazonian forest,” project coordinator Paulo Artaxo told Popular Mechanics magazine. The tower is situated over 170 km (100 miles) from the nearest city, Manaus, in northern Brazil. Remote and tall, the ATTO tower will provide scientists with data that could help analyze a large area of the rainforest. Measurements at lower altitudes are less reliable, as they are more dependent on local fluctuations. The results of the monitoring will be uploaded via satellite internet, making them available to any researcher. The 8.4 million euro (US$9.9 million) project is the result of collaboration between the Max Planck Institute (MPI) for Chemistry, in Mainz, Germany, the National Institute for Amazon Research (INPA), and the University of the State of Amazonas, both located in Manaus, Brazil.